At the Radiodays Europe Conference in Milan today, a group of major broadcasters from Germany, UK, Netherlands, Italy, and Poland announced support for a common European specification for digital radio receivers, including FM, DAB, DAB+, and agreed levels of receiver sensitivity. It was confirmed at the conference that major manufacturers including Panasonic, Philips, Roberts Radio and Pure had agreed to build to the common European specification. The broadcasters at the RadioDays Europe Conference said that pan-European collaboration is essential to support the growth of digital radio and to ensure a genuine single European market for digital radio. The broadcasters will encourage manufacturers to build to the specification, including FM, DAB and DAB+ and minimum receiver sensitivity criteria to support expanding digital coverage. This clarity will enable car and radio manufacturers to build and supply the European market with confidence and will help drive competition, innovation and lower costs for consumers. Speaking at the conference Laurence Harrison from Digital Radio UK and Jacqueline Bierhorst, Project Director from Digital Radio+ Netherlands, highlighted digital radio progress by market and spoke of a new era of cross-nation collaboration for consumer and supply chain communications. 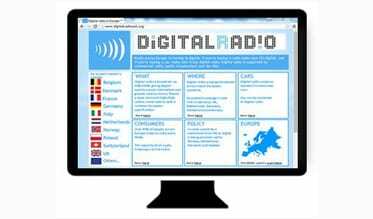 They announced the launch of a new pan-European web page with a common and consistent European digital radio logo, giving details of the new common specification, digital radio facts and coverage information for each country. The Digital Radio European web page will be launched in June 2015 [image above]. In the session Annika Nyberg Frankenhaeuser, EBU Media Director, confirmed that digital radio is the future for radio broadcasters across Europe. • A growing number of markets showing long term commitment to digital radio. Please find a link to the presentation here.